Yesterday, November 11th, was our 19th wedding anniversary. I have to admit that it hasn't always been easy, but I have learned a lot along the way. On this year's anniversary I learned that my husband can still surprise me because I did not expect to receive flowers on my anniversary, yet I did. 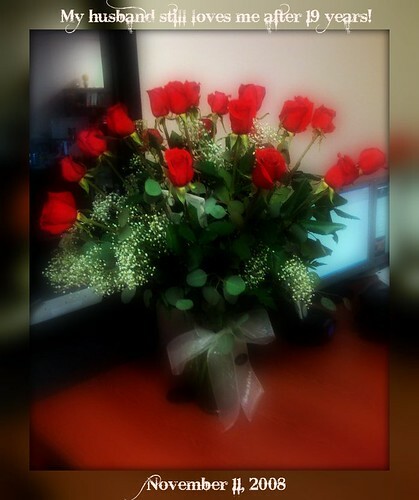 I received the most beautiful bouquet of 19 perfect red roses. Roses that were so perfect they didn't look real. The card read, "So far, so good. Love, Me".